13 MELISH, J. Map of the United States with contiguous British & Spanish Possessions. Philadelphia, 1816. Limites en col. d'�poque. Carte murale divis�e en 40 segments, entoil�e et bord�e de soie verte. Petites galeries de vers dans le "Mississippi territory" et 2 dans le "Gulf of Mexico", infimes rousseurs, d�chirure de 4 cm dans la Louisiane sans manque, d�chirure de 4 cm en haut � gauche affectant la surface grav�e. Les segments se d�collent partiellement de la toile. Bel exemplaire. - Wall map dissected in 40 pieces, backed on linen and edged in green silk. Copper-engraved map on six sheets. Paper slightly age toned. Small wormholes in the "Mississippi territory" and 2 others in the "Gulf of Mexico". Panels separating from linen. Tear of 4 cm next to Sabine River restored and a tear of 4 cm upper left part running into the printed area. Original outline colour by state or territory. Excellent condition. 885 x 1430 mm. � Premi�re �dition, sixi�me �tat (Ristow). Rare carte murale repr�sentant la nouvelle nation d�une c�te � l�autre. J. Melish est l��diteur de cartes am�ricain le plus important de cette deuxi�me d�cade. Ses cartes sont dress�es d�apr�s les cartes militaires et officielles les plus r�centes, il r�vise et corrige ses cartes r�guli�rement et limite leur tirage � 100 exemplaires. Au d�part, Melish pr�voyait de ne repr�senter que la partie � l�est des Montagnes Rocheuses mais il d�cida de rajouter 2 feuilles afin de montrer l�ampleur du territoire des Etats-Unis d�une c�te � l�autre. Cette carte �tait si pr�cise et exacte, qu�elle fut utilis�e lors de diff�rent trait�s afin de d�finir les fronti�res. - "Map of the United States with contiguous British & Spanish Possessions Compiled from the latest & best authorities by John Melish". Engraved by J. Vallance and [H.S.] Tanner. Nicely enhanced by the figure of an American bald eagle carrying olive branches, arrows and a striped shield. FIRST EDITION in a sixth state. The following new place names are introduced in southern Indiana: Brookville, Blackford, Brownstown, Busserow C., Centreville, Darlington, Fredericksburg, Lawrenceburg, Loughery, Cr., Madison, Orleans, Paoli, Princeton, Salem, Shaker T., Troy, Vernon, and White Water R. In southern Indiana "Harmonist Society" is changed to "Harmony" and "Clarksville" to "New Albany". A dotted line is added in eastern Indiana to enclose a land grant west of Centreville. The name "Charleston" is added in northern Kentucky. The first state of the map (1816), is the unique proof copy deposited in the Library of Congress for copyright purposes. Many editions and states followed, as late as 1823, supposedly done in no more than one hundred issues each. First published in 1816, this great wall map was among the first to show the new nation from coast to coast. An exquisite map, it distinguished Melish as the leading American map publisher of the second decade and placed American maps on equal footing with those produced by the prestigious firms in London and Paris. 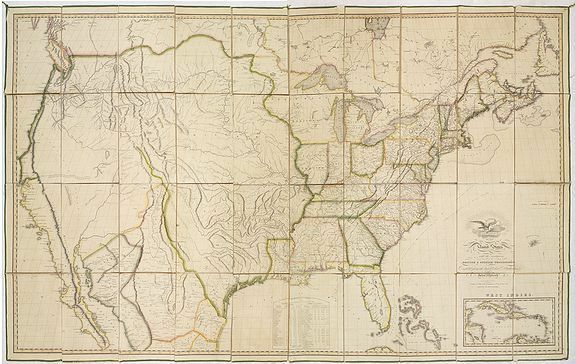 Incorporating data from state and military maps as these became available Melish frequently revised and corrected the plates, limiting each printing to 100 copies. (Schwartz and Ehrenberg). Melish originally planned to include only the portion of the United States east of the Rocky Mountains, but decided to add two sheets, in order to show "at a glance the whole extent of the United States territory from sea to sea" (Melish, Geographical Description, Philadelphia, 1816). Martin and Ristow identify seven states of the 1816 edition. Melish published new editions in 1818 (five states), 1819 (two states), 1820 (eight states), 1822 (two states), and 1823 (one state) for a total of twenty five different issues. Born in Scotland, Melish settled in the United States in 1811. He is credited with bringing American cartography up to world standards. Walter Ristow couldn't heap enough praise on to this map. The map was considered so accurate that it was used in several treaty negotiations to determine boundaries. - W.W. Ristow, American maps and mapmakers, 1985.